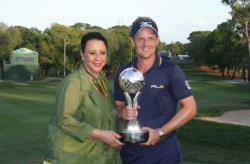 Salamander Hotels & Resorts CEO & Founder Sheila C. Johnson and 2012 Transitions Championship Winner Luke Donald on the 18th fairway at Innisbrook Resort's Copperhead Course. Luke Donald’s winning total of 13-under par at the PGA TOUR’s Transitions Championship – played at Innisbrook, a Salamander Golf & Spa Resor t – has delivered a 13 percent discount for future guests. The Tampa Bay/St. Petersburg area resort was offering savings to match the winning score to par on its famed Copperhead Course. Donald won in a four-way playoff with Jim Furyk, Robert Garrigus and Sang-Moon Bae. The Englishman birdied the first playoff hole to regain the World Number One ranking from Rory McIlroy. Throughout the tournament, players consistently raved about the condition of the course – rated by professionals as the finest Florida course on the PGA TOUR – as well as the amenities at the recently renovated resort. All reservations related to Innisbrook’s discount offer will be also entered into a drawing to win a two-night stay at the new Grand Golf Resorts of Florida collection, which includes Innisbrook, Reunion Resort in Orlando and Hammock Beach in Palm Coast. The group is managed by Salamander Hotels & Resorts, founded by Sheila C. Johnson. Reservations that use the 13 percent discount must be made via phone by calling 800-492-6899. For resort information, visit http://www.visitinnisbrook.com. Bookings must be made by April 30, 2012, and the discount is valid for a stay between April 15, 2012 and January 15, 2013. This offer is not applicable to groups or previously booked reservations. Operated by Salamander Hotels & Resorts – and part of the new Grand Golf Resorts of Florida collection – Innisbrook is situated on 900 wooded acres of rolling hills in the St. Petersburg/Clearwater area on Florida’s Gulf Coast, and is located just 25 minutes from Tampa International Airport. Recently and completely renovated, the resort features 72 holes of championship golf, 600 spacious guest suites and rooms, four restaurants and three bars, the Innisbrook Golf Institute, 11 tennis courts, the new luxury Indaba Spa with 12 treatment rooms and state-of-the-art Fitness Center, six heated swimming pool complexes, a nature preserve, and three conference halls with 65,000 square feet of meeting space. The resort hosts the annual PGA TOUR Transitions Championship at its famed Copperhead Course, and the LPGA-supported Legends Tour Open Championship, held annually at the equally challenging Island Course. Innisbrook is a member of the prestigious Preferred Hotels & Resorts, and Preferred Golf Club programs. For additional information call 727.942.2000 or visit http://www.innisbrookgolfresort.com. Salamander Hotels & Resorts is a privately owned and operated company based in Middleburg, VA, just outside Washington, D.C. Founded by entrepreneur Sheila C. Johnson in 2005, the company has a portfolio that features the Grand Golf Resorts of Florida, a collection of three stellar golf resorts including the recently renovated Innisbrook Resort near Tampa, Reunion Resort in Orlando and the oceanfront Hammock Beach Resort in Palm Coast; Grand Resorts at Cap Cana, a collection of luxurious properties in the Dominican Republic including the oceanfront Sanctuary Cap Cana, the new marina-inspired Fishing Lodge Cap Cana, and the future Ocean Club Cap Cana; the Forbes Five-Star- and AAA Five Diamond-rated Woodlands Inn near Charleston, SC; and the eagerly anticipated Salamander Resort & Spa in Middleburg, a 340-acre equestrian-themed, ultra-luxury resort located near Washington, D.C. opening in 2013. For additional information, call (540) 687-3710 or visit http://www.salamanderhotels.com.